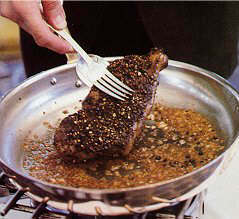 History: A classic French Steak preparation. I recommend using a very good quality steak. The Certified Angus Beef brand, available at most major markets is a good choice. If you go to a butcher, you could also ask for "USDA Prime Grade"---it's the best you and buy, although very expensive! Description: Steak coated with crushed black peppercorns in a rich red wine-brandy and shallot gravy. Saut to desired doneness with 1 tablespoon of butter over medium-high heat in a heavy bottom pan, (4 minutes on each side will be about medium-rare) remove from pan and let rest while you make the sauce. Using the same pan; remove the fat, if any, add the shallots and swirl with a spoon. Remove the pan from the burner, add the red wine and brandy quickly, then return to the burner. This is done so the alcohol that is evaporating doesn't explode in your face. Reduce the wine/brandy mixture to almost a syrup then add demi-glace, butter and saut ed steak. Heat the steak in the sauce one minute, add a few drops of water to keep the sauce fluid, adjust taste with salt if needed. Garnish with generous sprigs of watercress. Sprinkle the steak with chopped chives.